Phishing is a type of deception designed to steal your valuable personal data, such as credit card numbers, Windows Live IDs, other account data and passwords, or other information. In e-mail messages, even if they appear to be from a coworker or someone you know. On your social networking Web site. On a fake Web site that accepts donations for charity. On Web sites that spoof your familiar sites using slightly different Web addresses, hoping you won’t notice. In your instant message program. On your cell phone or other mobile device. Often phishing scams rely on placing links in e-mail messages, on Web sites, or in instant messages that seem to come from a service that you trust, like your bank, credit card company, or social networking site. How Bitdefender Anti-Phishing Protects ? BitDefender Anti-Phishing Free Edition is the easiest way to make sure you are protected against phishing attacks when you are surfing the Internet or chatting on an instant messaging network. This lite and easy to use tool scans accessed web sites and alerts you if there are any phishing threats. Web sites you know and trust can be added to a White List and will no longer be checked by BitDefender. 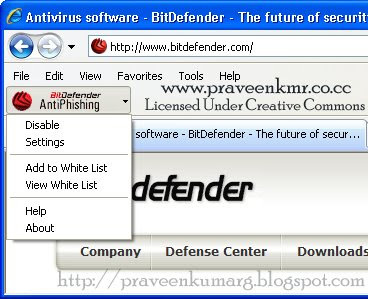 BitDefender Anti-Phishing integrates directly through an intuitive and easy-to-use toolbar into Internet Explorer and Mozilla Firefox. The person you are chatting with might (knowingly or unknowingly) send you a link to a website that is in the BitDefender database of websites used for phishing attacks. If such a link is sent, BitDefender will not allow it to be displayed in the chat window and will inform you that a link has been blocked. You must create an account within 15 days after installing BitDefender. Otherwise, BitDefender will no longer update.